You need four wood boards that are 2 by 12 by 16 inches in size, one wood board that's 2 by 4 by 56 inches, and one that's 2 by 12 by 60 inches. The tools and supplies required for this project include a box of 3-inch wood screws with flush trim, wood plugs, wood glue, measuring tape, a screw gun, and multiple fine-grit sanding blocks. 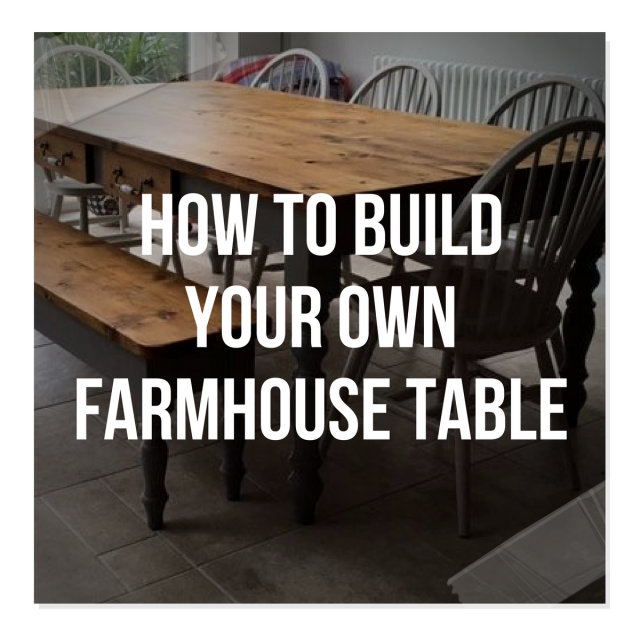 Search for cedar wood or pine when buying lumber for your farmhouse table. These woods are aesthetically appealing, durable enough to withstand years of use, easy to work with, and widely available. The four 2-inch by 12-inch by 16-inch boards make up the legs of your table. Stand the legs upright on a flat work surface, and grab your measuring tape. Separate two pairs of legs by 56 inches, and make sure the leg pairs are parallel to each other. Next, place the 2-inch by 12-inch by 60-inch board directly on top of the legs. This piece is the table surface. Make sure the ends of the surface are flush with the top of the table legs. Use a screw gun to carefully drill four flush-trim 3-inch wooden screws through the surface of the table and straight into the end of each leg. Make sure the legs are secure and not wobbly.